The Hospital-acquired Infections in Pennsylvania report includes information on infections that patients contracted while in the hospital. 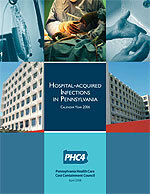 The number and rate of infections that occurred during calendar year 2006 are reported for each of Pennsylvania's 165 general acute care hospitals. This report also includes some limited comparative information by displaying the two most similar data collection time periods: Quarter 4, 2005 and Quarter 4, 2006. Additional information can be accessed via the interactive database, Create Your Own Report. For example, data on device-associated and non device-associated infections, as well as, data for calendar year 2005 is available. Understanding the peer groups. Because there are differences among hospitals in the services provided and the number of patients treated, hospitals are grouped into "peer groups" to assist the reader in recognizing similar hospitals. Each peer group is comprised of hospitals that are similar in the complexity of services offered (including percent of surgical procedures performed) and the number of patients treated. The hospitals using electronic hospital-acquired infection surveillance software are noted, since they may have a higher number of reported infections due to more comprehensive reporting, rather than a higher infection rate. Click here to access the Peer Group Directory for the names of hospitals in each peer group.